Lot Detail - Clipper ship Card - St. Charles, Sutton & Company, Philadelphia. 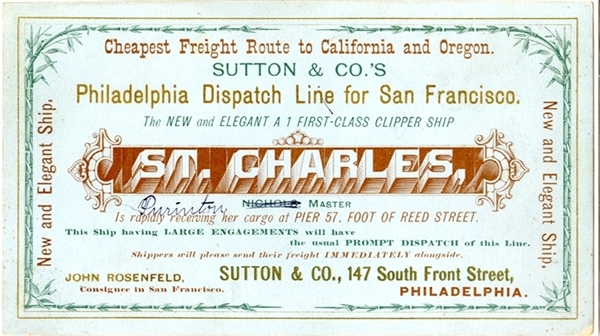 Clipper ship Card - St. Charles, Sutton & Company, Philadelphia. Rare clipper ship card advertising the “St. Charles” helmed by Master Purinton, with “Cheapest Freight Route to California and Oregon.” John Rosenfeld, Consignee in San Francisco. 6-1/4”x3-1/2” c. 1850s. Fine condition.